Sherri Hill is on the a-list with this amazing two-piece dress. The gorgeous long black dress features a high-neck crop top with a trendy open-back design. Form-fitting and romantic, the mermaid skirt has a fabulous back ruffle that cascades from the natural waistline and ends in an impressive train. This black two-piece prom dress by Sherri Hill has a stunning display of vivid red roses and greenery embroidered along the dramatically ruffled train. 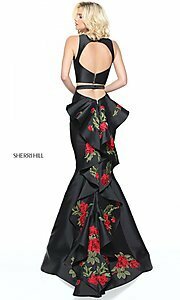 Be fabulous and red-carpet-ready wearing this sleek two-piece black Sherri Hill evening dress at prom or on a pageant stage.